Never a network to ignore the fine details and the importance of family fun, Hallmark Channel has done it again bringing Kitten Bowl II, its feline football fiesta back for Super Bowl Sunday. And is there anything better than heartwarming humor and 92 kittens– all of whom were up for adoption and, since the taping, have all been placed in loving homes? Hosted by model and animal advocate Beth Stern, Kitten Bowl II features play-by-play announcers John Sterling and Mary Carillo. And if you needed another reason to smile, Hallmark’s Feline Football League (FFL) snagged network commentator and retired quarterback Boomer Esiason as their fun-loving commissioner. Kitten Bowl II’s promo music video keeps up with the real Super Bowl as the “players” take to the field during a Katy Perry song. Which one? Why ‘Roar’ of course! 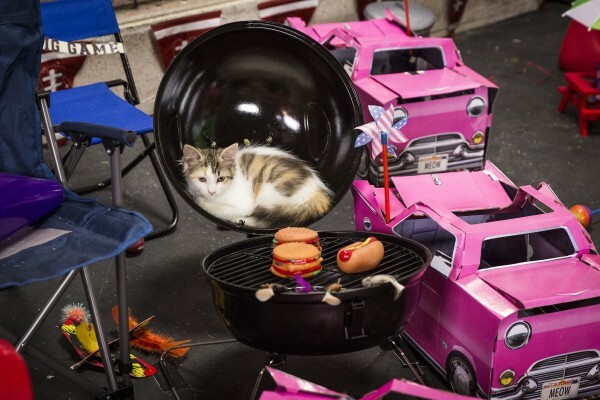 Kitten Bowl II definitely brings new meaning to a TAILgate party. With celebrity appearances and plenty of laughs, there’ll be no fur flying at Kitten Bowl II– just family-driven fun that also emphasizes the importance of pet adoption. To find out more about Kitten Bowl II, pet adoption, and the foster work of Beth and husband Howard Stern, listen to my conversation with Beth Stern here. Don’t miss Hallmark Channel’s Kitten Bowl II on Sunday, February 1st 12/11c . Hallmark Channel’s Kitten Bowl II tailgate party! Copyright 2015 Crown Media United States, LLC/Photographer: Marc Lemoine.